With Wi-Fi Direct, portable and stationary Wi-Fi devices can connect to each other directly, with or without access to a Wi-Fi network or hotspot. This enables content sharing, printer sharing, gaming, and Internet connection sharing (a feature that may be limited by the manufacturer, however — protecting wireless carriers' interests, for example). Unlike ad hoc wireless networking, Wi-Fi Direct enables the highest wireless security available today, WPA2, rather than WEP. Wi-Fi Direct has 802.11n higher data rates (300 Mbps+) and range capabilities, also unlike ad-hoc networking, which is limited to 802.11g. Setting up a Wi-Fi Direct connection can be as simple as pushing a button, and device discovery is also another unique feature. Many devices can join the Wi-Fi Direct connection, and it's backward compatible with non-Wi-Fi Direct devices, so as long as one device has the Wi-Fi Direct technology, older devices can still connect. 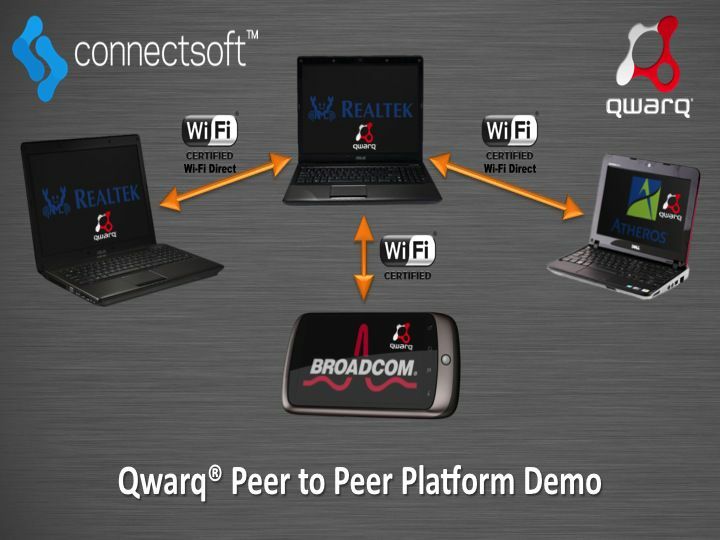 The demo showcased some of the best features of Wi-Fi Direct: instant connectivity and fast wireless-n speeds. We watched as a large photo was quickly transferred from one laptop to the other, and as multiple users played an Asteroid-type game together and chatted about it in the game at the same time. This was all done without connection to a traditional network or Internet access. The first Wi-Fi Direct certified products included several wi-fi network cards from Intel, Atheros, Broadcom, Realtek, and Ralink. Consumer electronics certified for Wi-Fi Direct as of January 2011 include Blu-ray players from LG and the Samsung Galaxy S smartphone. Because all of the major consumer electronics manufacturers are in support of the Wi-Fi Direct technology, it's expected that Wi-Fi Direct will be found in the majority of computers, notebooks, smartphones, tablets, televisions, and other CE products. It's definitely a wireless technology to look for in 2011 and beyond. For mobile pros, in particular, there are several uses for Wi-Fi Direct. You can have a meeting at the client's or customer's office and not need to be connected to their network to be able to share files, give presentations, etc. It may be easier to connect via Wi-Fi Direct, and it's more secure for the office network (you're welcome, IT administrators). Also, when you're at a wireless hotspot with others, you can still get your Internet access from the hotspot, but use more secure Wi-Fi Direct to share your files with your colleagues. And since Wi-Fi Direct works cross-platform and across the full gamut of wi-fi capable devices, the sky's really the limit when it comes to the types of directly-connected applications that can be used both on the go or at home/home office. For more information about Wi-Fi Direct (including a cute animation showing it in action), see the Wi-Fi Alliance's Wi-Fi Direct page.